Boneless skinless chicken breasts are a kitchen staple. They make a quick and convenient meal, easily sautéed on the stovetop or baked in the oven. But have you ever thought about smoking a boneless skinless chicken breast? Chances are, more often than not, you have found yourself smoking the whole chicken rather than individual pieces. If that rings true for you, then you should be aware – you are missing out on an entire realm of possibilities! Smoked chicken breast is tender, juicy, and jam-packed full of flavor. You might find yourself wondering how it is possible to smoke such a delicate piece of meat. 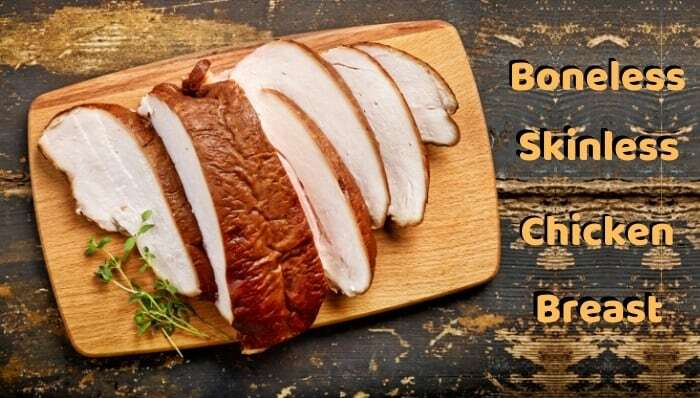 Breast meat is exceptionally lean and can quickly turn tough if you push it past its target temperature. We will be exploring how to add flavor to the meat, how long to smoke boneless skinless chicken breasts, and some overall tips for smoking. Plus, we will share some of our favorite ways to prepare the smoked chicken breast. 1.2 Why should you brine the chicken? Before you ever think about tossing your chicken in the smoker, you need to add moisture to the meat. Are you contemplating skipping this step? You will regret it later when your chicken is tough and dry. So how can you pack flavor and moisture into a chicken breast? You have two options – brining or marinating. Brines and marinades can play a vital role in smoking chicken, but you should never confuse the two terms. They are not interchangeable. The main goal of brine is to increase moisture. Flavor is the main goal of a marinade. The two achieve these goals in similar yet different ways. Brine is made of simply salt and water. You can add other flavorings (such as peppercorns or lemon), but salt is the most important component. When the chicken soaks in the brine, osmosis draws out the water inside the cells of the meat. The brine is drawn into the chicken, taking many of the flavors with it. The water is held there by the salt, keeping the meat tender and juicy even while cooking. Marinades are less about moisture and more about flavor. They are a sauce that you soak the chicken in to impart a certain flavor profile. Marinades often have an acidic base (such as citrus or wine) to help break down the protein structures that can make meat tough. The marinade catches between the proteins while breaking them down, leaving behind lots of great flavor. Why should you brine the chicken? While both brining and marinating the chicken have their benefits, we recommend a brine over a marinade for a couple of reasons. Mainly, increasing the moisture and juiciness is a definite must when cooking with a dry method like smoking. The other reason is that marinating the meat is only going to work on about ¼ inch of the outside meat. Marinades do not penetrate deep enough into the meat. So you run the risk of a dry, flavorless center. 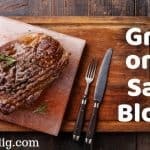 If you are looking to add flavor to the meat, consider brining first, and then either applying a rub or a mop. To begin brining your chicken breasts, place them in a large container with your saltwater mixture. As a basic rule of thumb, dissolve a ¼ cup of kosher salt per quart of water needed to cover the chicken breasts completely. You can also add sugar and other flavorings like lemon juice, garlic, or black pepper. Be sure to check that your container fits comfortably inside your refrigerator. You will need to refrigerate the chicken breasts in brine overnight for maximum efficiency of the brine. After resting in the brine, you can pat the chicken breasts dry and season them as desired before placing them in the smoker. It is not necessary to rinse the brine off of the chicken prior to cooking. Dry rubs are a quick and easy way to add flavor to your chicken. A dry rub is just a mixture of different seasonings rubbed on to the meat without any liquid added. You can use any combination of seasonings. 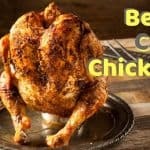 There are many different recipes available for chicken breast dry rubs, or you can try making your own! One of the most commonly used seasonings in a dry rub is smoked paprika. This is an especially great spice to use when smoking the chicken breasts. It really amplifies the delicious, smoky flavor. Smoked paprika also gives the chicken a bold, appetizing color while cooking. Combine it with salt, pepper, brown sugar, and your other favorite seasonings for a mouthwatering dry rub. Apply the dry rub liberally to the chicken breast and rub it into the meat on all sides. You might know them as bastes or a basting sauce, but mops have a special place in smoking. They are a delicious method of adding flavor throughout the cooking process. Mops are a thin sauce applied with a brush to increase flavor and add moisture during smoking. You will apply these in several thin layers at incremental periods to help build the flavor. Mops can be made from a variety of different ingredients, but one of the most common mop ingredients is vinegar. Just like with a marinade, the acid helps to break down tough proteins, making the meat tender. You can add other liquids (such as beer or fruit juice) and seasonings. If you are also using a dry rub on your chicken breasts, be sure that the flavor of the mop is complementary to the flavors in the rub. One way to do this is to make a mop using a few tablespoons of your dry rub mixed into cider vinegar or beer. You can also use premade barbecue sauces partially thinned with water, beer, or vinegar. 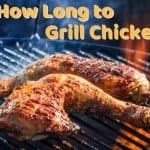 As we discussed in our guide for how long to grill chicken, the target internal temperature for perfectly cooked chicken is 165 degrees Fahrenheit. Keep your smoker at a constant 250 degrees Fahrenheit. This is best done by leaving the chimney baffle open and adjusting the intake baffle to about halfway. If using a mop, do so very sparingly, for at least the first 45 minutes. Opening the door repeatedly will cause heat loss. After 45 minutes, you can baste the chicken as desired until it finishes cooking. It should take around an hour for your chicken breasts to reach an internal temperature of 165 degrees Fahrenheit. Don’t just rely on the cooking time though, as many different factors can cause that to increase or decrease. To ensure that your chicken is safe to consume, you will need to use a thermometer. Place the thermometer into the thickest part of the meat for the most accurate reading. A great instant-read thermometer is one of the most invaluable tools you can own for smoking! Chicken breasts are small cuts that don’t need to rest for long. Allow them to rest for five minutes before serving. This ensures that the juices lock inside the meat, rather than running out when you start slicing! We can debate for days about what wood works best for smoked chicken breast! It is all a matter of personal preference. Some of the most recommended woods include cherry and apple. Apple is very mild and has a subtle fruity flavor. Cherry is similarly mild and fruity, and many people say it is the best wood for smoking just about anything. One wood that we really like for smoking chicken breasts is mesquite. The flavor is so strong and earthy! But you have to be cautious about how much mesquite wood you use. It is one of the hottest burning woods, so you will need to adjust accordingly. Also highly recommended are other sweet fruit woods (plum, peach, apricot) and pecan. Pecan is sweet and mild, and the flavor is somewhat reminiscent of hickory. Hickory tends to be better suited to pork and beef though. Pecan has a very delicious flavor and is one of the best woods for smoking in general. Bacon makes everything better, doesn’t it? Of course it does! So if you have come this far, let’s take your next smoked chicken breast up a notch! After you have brined your chicken breasts, liberally apply your favorite dry rub. Then, lay out 2-3 slices of bacon, placing the chicken breast on top. Moving from one end to the other, tightly wrap the bacon around the chicken breast. You can use toothpicks to hold the bacon in place during smoking. Be mindful that bacon wrapped chicken breasts can take upwards of 60-90 minutes to reach 165 degrees internally. You will also need to flip them once halfway through cooking. Allow your gorgeous bacon wrapped boneless skinless chicken breasts to rest for five minutes before devouring! Once you have tried smoking boneless skinless chicken breasts, you will find yourself wanting to do it all of the time! Try new combinations of woods and rubs or mops! You can even try multiple rubs or sauces in one smoking session. Cook in bulk and you will have delicious food for days. The possibilities are endless, and who doesn’t love eating deliciously smoked chicken? Never again will chicken be boring or bland.